Keith Poche caught some good quality on day 2 from the marina wall that Ott DeFoe exploited on day 4. 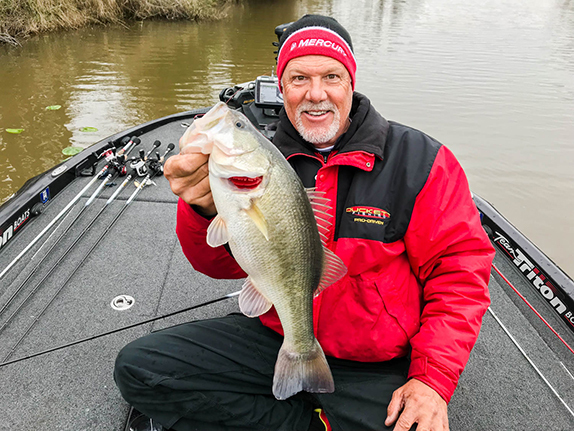 Keith Poche has always been friendly with Ott DeFoe, but the longtime Bassmaster Elite Series competitors and current MLF Bass Pro Tour anglers have rarely � if ever � discussed fishing locations during a tournament. The conversation during which Poche told DeFoe about the loaded-up marina wall he'd found on the lower end of Loudoun Lake stemmed from a chance encounter in the boat staging area prior to the day-2 weigh-in. "We just started talking and I told him 'good job' and 'I hope you win'," Poche said Sunday afternoon from the Classic Expo, where he'd spent the final day of the 49th Bassmaster Classic working for sponsors after being eliminated from the tournament the previous day. "When he asked how I'd done, I told him I'd caught a few and lost some good ones, and I told him where I'd been fishing. "I said all he had to do was get on the outside of that wall and it was absolute money." 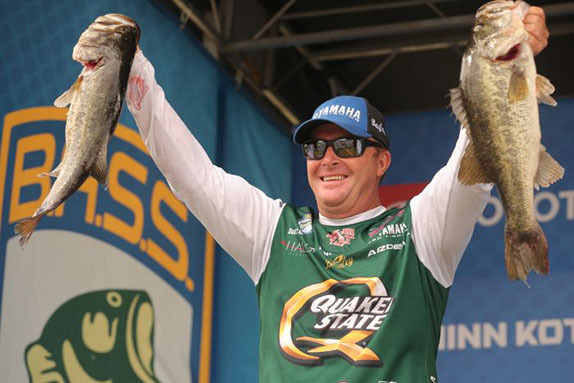 The wall, which Poche described as 60 to 70 yards in length, gave up four of the five fish DeFoe took to the scale on the final day en route to winning the Classic on his home water. Ironically, such an exchange is prohibited on the circuit the two anglers now fish, as the BPT disallows the swapping of specific fishing information among competitors beginning at 12:01 a.m. on the first practice day. Poche, competing in his second Classic, put himself in a major hole by weighing just two keepers for 3-03 on day 1. He discovered the wall late on the second day and exploited it for most of the 12-03 stringer that moved him from 50th place (third from the bottom on the standings sheet) to 36th. 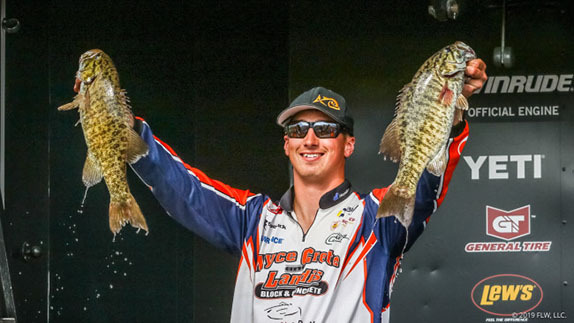 "I got some bites close to there (in practice), but the fish kept leaving me as things were changing," he said. "That wall, when the sun comes out I think it heats it up and the fish get right up against it to get warm. "I pulled up on it (late on day 2) and they were there. I'd been throwing a little crankbait, but the water was too deep for that, so I picked up a vibrating jig and started slow-rolling it right there on the edge. The first fish I hooked was over 4 pounds, but it jumped and spit the bait. "I just kept working it and kept getting bit," he continued, "and pretty soon I was culling. It was on." He laments that it wasn't him who was out there pounding the wall on day 3. If he'd uncovered its potential sooner, he thinks he could've fished it and rested it periodically each day and that it likely would've been productive throughout the tournament. "I didn't have time to really dial it in � it was a heat-of-the-moment thing and I was just chunking and winding. When I make on-the-spot decisions and in-the-moment changes like that, I tend to do better. I'm not a marina guy and I don't like fishing them, but that situation looked good and it all made sense. 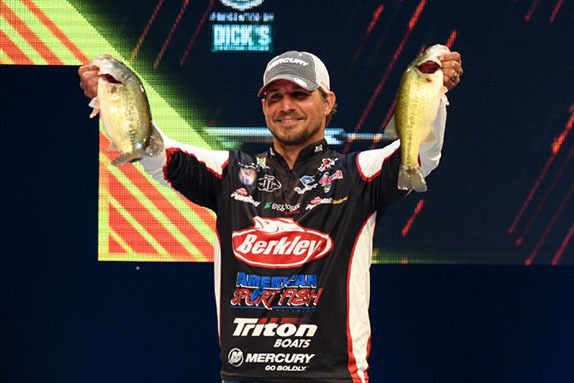 "Even though it wasn't me out there getting it done (on day 3), knowing I found a spot that could've won the Bassmaster Classic or helped to win it means a lot. It's not every day that you find places like that." DeFoe said he planned to treat Poche to a steak dinner. Poche had a somewhat larger reward in mind � perhaps a double-digit percentage of the $300,000 winner's check. "I told him I wanted 10 percent," Poche said. "He laughed, but now I'm hoping he took it seriously."